Global Positioning Systems, widely known as GPSs, have a great importance since the days of World War II. Although the initial focus was mainly on military targeting, fleet management, and navigation, commercial usage began finding relevance as the advantages of radiolocation were extended to (but not limited to) tracking down stolen vehicles and guiding civilians to the nearest hospital, gas station, hotel, and so on. 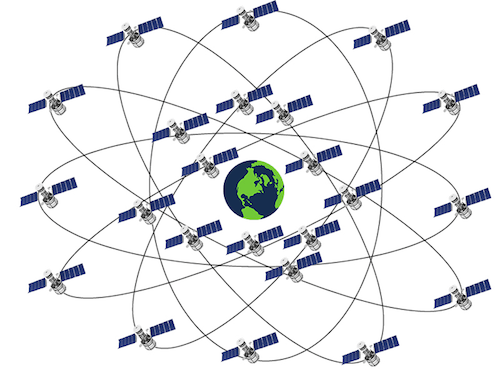 A GPS system consists of a network of 24 orbiting satellites, called NAVSTAR (Navigation System with Time and Ranging), and placed in space in six different orbital paths with four satellites in each orbital plane and covering the entire earth under their signal beams. The orbital period of these satellites is twelve hours. The satellite signals can be received anywhere and at any time in the world. The spacing of the satellites is arranged such that a minimum of five satellites are in view from every point on the globe. The first GPS satellite was launched in February 1978. Each satellite is expected to last approx 7.5 years, and replacements are constantly being built and launched into orbit. Each satellite is placed at an altitude of about 10,900 nautical miles and weights about 862 kg. The satellites extend to about 5.2m (17ft) in space including the solar panels. Each satellite transmits on three frequencies. The GPS is based on well known concept called the triangulation technique. Consider the GPS receiver MS to be placed on an imaginary sphere. The radius of imaginary sphere is equal to the distance between satellite "A" and the receiver on the ground (with the satellite "A" as the center of the sphere). Now the GPS receiver MS is also a point on another imaginary sphere with a second satellite "B" at its center. We can say that the GPS receiver is somewhere on the circle formed by the intersection of these two spheres. Then, with a measurement of distance from a third satellite "C", the position of the receiver is narrowed down to just two points on the circle, one of which is imaginary and is eliminated from the calculations. 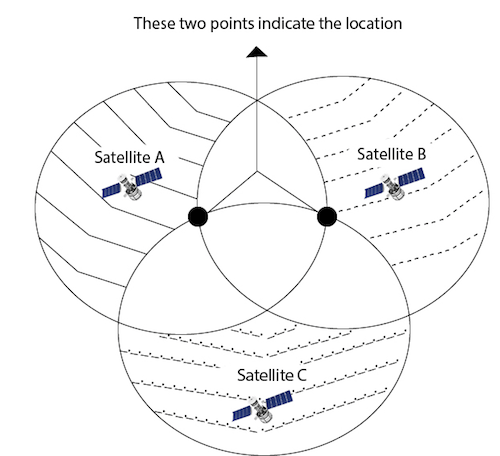 As a result, the distance measured from three satellites suffices to determine the position of the GPS receiver on earth. 1957 - Soviet Union launched Sputnik I satellite. 1960s - U.S. Navy tracked U.S. submarines with satellite navigation. 1978 - NAVSTAR Block I GPS satellite was launched. 1983 - U.S. announced that it will make GPS available for civilian use after Korean Air flight 007 shot down. 1989 - Magellan introduced NAV 1000, the first hand-held GPS device. First Block II satellite is launched. 1993 - Constellation of 24 satellite system became operational. 1995 - Full Operational Capability (FOC) declared. 2000 - Selective Availability discontinued by the U.S. Government. 2004 - Qualcomm successfully completed test of live assisted GPS on a mobile phone. 2008 - Block II satellite launched. 2016 - GPS IIF satellite launched. At the start, more than 1000 portable commercial GPS receivers were purchased for military use. They were carried by soldiers and attached to vehicles, helicopters, and aircraft instrument panels. GPS receivers were used in several aircrafts, including B-2 bombers and F-16 fighters etc. Navy ships used them for rendezvous, minesweeping, and aircraft operations. GPS has become important for all military operations and weapons systems. In additions, GPS benefits nonmilitary operations. GPS is used on satellites to obtain highly accurate orbit data and to control spacecraft orientation. GPS has a various applications on land, at sea, and in the air. GPS can be used everywhere except indoors and places where a GPS signal cannot be received because of natural or man-made obstructions. Both military and commercial aircraft use GPS for navigation purposes. It is also used by commercial fisherman and boaters to aid in navigation. The precision timing capability provided by GPS is used by the scientific community for research purposes. The GPS enables survey units to help surveyors to set up their survey sites fairly quickly. GPS is also used for noncommercial purposes by car racers, hikers, hunters, mountain bikers, and cross-country skiers. GPS also helps in providing emergency roadside assistance, by allowing an accident victim to transmit his or her position to the nearest response center at the push of a button. GPS is also helping to save lives. Many police, fire, and emergency medical service units are using GPS receivers to determine the location of a police car, a fire truck, or an ambulance nearest to an emergency, enabling the quickest possible response in death or life situations. Automobile manufacturers are offering moving map displays, guided by GPS receivers as an option on new vehicles. There are several factors that introduce error into GPS position calculations and prevent us from achieving the best possible accuracy. A major source of error in GPS arises from the fact that the speed of the radio signals is constant only in a vacuum which means that distance measurements may vary as the values of the speed of signal vary in the atmosphere. The atmosphere, as we know, is composed of the ionosphere and the troposphere. The presence of the troposphere essentially composed of water vapor) is known to cause errors due to variation of temperature and pressure, and the particles in the ionosphere are known to cause significant measurement errors (as would be the case with bad clocks! ).